The Corsair, which we poked fun at when it was still being teased out, was revealed to the world online at midnight Wednesday ahead of its real-life debut at the New York Auto Show slated for this week. I’m looking at it for the first time myself as I’m writing this, and haven’t found a bad angle on the exterior yet. The cockpit is cursed with the same tacked-on-tablet infotainment interface automakers insist on clinging to everywhere, but otherwise looks refined and smooth. Lincoln appears to be running with a modernized Howard Hughes aesthetic and I am 100 percent here for it. There seems to be a vaguely retrofuturistic aeronautical look around the shapes and trim choices, which I think is really working. Really, the Corsair is a scaled-down Lincoln Aviator, which I also loved when it was unveiled last year. As far as what’s below the Corsair’s sculpted skin, Lincoln says you’ll be able to pick from a standard 2.0-liter turbo four (250 horsepower, 275 lb.-ft. of torque) with front or all-wheel drive or optional 2.3-liter turbo (280 HP, 310 lb.-ft. of torque) with all-wheel. 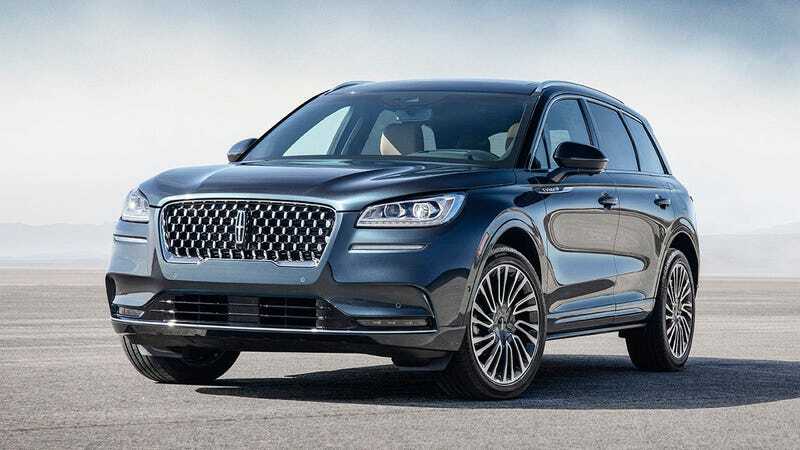 Both come with an eight-speed automatic and both those power figures were qualified with “targeted” in the press materials meaning, I guess, that Lincoln hasn’t quite finished dialing its engines in yet. You can take a closer look at the preliminary spec sheet yourself if you’d like to dig a little deeper. Convenience technology we’ve come to know and love in luxury cars like a Head-Up display, a whole suite of driver assistance tools and the ability to use your phone as your key will make their way into Corsairs and, more remarkably, there’s a blue interior option. But the Corsair’s coolest gimmick appears to be its “soundscape.” If you scroll to the bottom of the car’s digital brochure, you can click buttons and hear what noises the Corsair will make for alerts (when your seatbelt isn’t on, some sort of error message is being displayed, and such). Instead of beeps and bongs, the Corsair plays melodious tones. It’s really quite lovely! Reminds me of playing with the alert noises on my 1994 Mac Performa. But, like, in a good way. It’s exciting to see Lincoln find a groove beyond the Navigator. Here’s hoping the Corsair is as nice to drive as it is to look at. And listen to. How about this for a tagline–"Lincoln ain't stinkin'!" Hey, where are you going?